Part 2 on Ella Baker’s biography by Barbara Ransby (part 1 is here) — and the more exciting part really, because in the SCLC and SNCC and SCEF Baker was able to do more of what she wanted to do. I’m reading J. Todd Moye’s biography of Ella Baker as well just now, and it cleared up one point of my confusion — the way that everyone respectfully called her Miss Baker even though she was married. That is what felt right to me earlier because I must have read it elsewhere, but I questioned myself and wrote something different. so I’m going to have to go back and take out the references to Mrs Baker. Anyway, in 1957, Ella Baker traveled south with Bayard Rustin as a representative of In Friendship to become part of the founding of the SCLC. There she saw the Women’s Political Council in action, who had helped launch the Montgomery bus boycott, and she applauded the formation of MIA, Montgomery Improvement Association to lead the struggle outside the structures of NAACP. And she questioned everything, especially King. SCLC was founded to provide an institutional framework to connect and strengthen struggle beyond Montgomery. It also made a strategic decision to stay away from a too-left politics — interesting that ‘Christian’ was at least partially included in the name to help distance it from any association with communism. It emphasized in these stages that it was only demanding the same rights as everyone else. There’s always a problem in the minority group that’s escalating up the ladder in this culture . . . it’s a problem of their not understanding the possibility of being divorced from those who are not in their social classification. Instead of the leader as a person who was supposed to be a magic man, you could develop individuals who were bound together by a concept that benefited the larger number of individuals and provided an opportunity for them to grow into being responsible for carrying out a program. This, of course, put her into conflict with King and the men who dominated the movement at this time. Baker kept her maiden name after her marriage, kept her rpivate life private, and did all she did while also helping raise her niece, as well as taking over the guardianship of Brenda Travis, who had lied about her age to join SNCC sit-in. She was detained, sent to Colored Girls Industrial School after another protest, did not have support of strong family. Baker managed all of these roles in ways that I find rather jaw-dropping, but it was accomplished through the strong community that she created around herself. She also insisted on movement as being about relationships, connections, not mobilisation and dues and top-down battles on the lines of the NAACP. The shift from transitory, high-profile events like the sit-ins and freedom rides to protracted day-to-day grassroots organizing in local communities was a significant turning point. Baker insisted that a movement was a web of social relationships…In order to be effective organizers in a particular community, Baker argued, activists had to form relationships, build trust, and engage in a democratic process of decision making together with community members. The goal was to politicize the community and empower ordinary people. this was Baker’s model, and in 1961 it became SNCC’s model. Thus SNCC attempted to organise the whole community, not just the middle classes. When they first went into a community, they started by talking to clergy and any others who had claims on being representatives of community, but they knocked on everyone’s doors. Ransby talks a little about the development of the Freedom Schools, education was always one of the methods closest to Baker’s heart. SNCC established over 50 alternative classrooms for political organizing and popular education, run by Charlie Cobb, Robert Moses, and Staughton Lynd among others. This highlighted for me one of the strange absences here, as Ransby tries to differentiate them from SCLC’s Citizenship schools by highlighting that Freedom Schools went way beyond teaching literacy for voting tests. In Septima Clark’s vision coming out of Highlander, this was never to have been the only role of Citizenship schools, but maybe it’s an indication of how routinized these had become under the SCLC? Myles Horton and Highlander are interesting absences here — not that they don’t appear at all. As an aside, Ransby notes Baker as attending a conference there on one occasion, and later that she worked to defend Highlander from closure. In another brief mention Ransby connects SNCC to Horton, and notes Baker starting up a new fundraising group called Operation Freedom in 1961 with Horton, the Bradens and others to again funnel money to activists for emergencies. 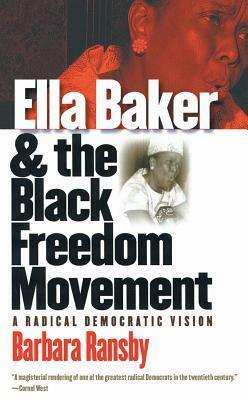 I was disappointed, though, not to learn more about Baker’s friendship with Rosa Parks, Myles Horton or Septima Clark. So I found it interesting that Baker’s theories are compared to Paolo Freire’s, a worthy comparison but interesting in the absence of Myles Horton and others from Highlander. But I would like to know more about connections to Africa and Nyerere’s Ujamaa movement. A last absence was more about the concerted attack on the NAACP in the south after Brown v Board, the number of people who lost their jobs by refusing to renounce NAACP membership — and the number of people who did renounce it. The number of branches that shut down all together, and all of them people that Ella knew, had visited, had encouraged to form branches and become members in the first place. That must have had a huge impact on her. Huge. But it isn’t really visible. I wanted a little more on the Southern Conference Education Fund run by Anne and Carl Braden, and founded by Jim Dombrowski who had helped found Highlander with Myles Horton way back in 1932. In 1963 Baker began working for SCEF, doing much the same as she had always done — whatever she thought was most needed to support local organising. The difference seemed to be that SCEF supported that. But I tracked down what seems to be the solitary book written on SCEF, which I am looking forward to reading and finding more.